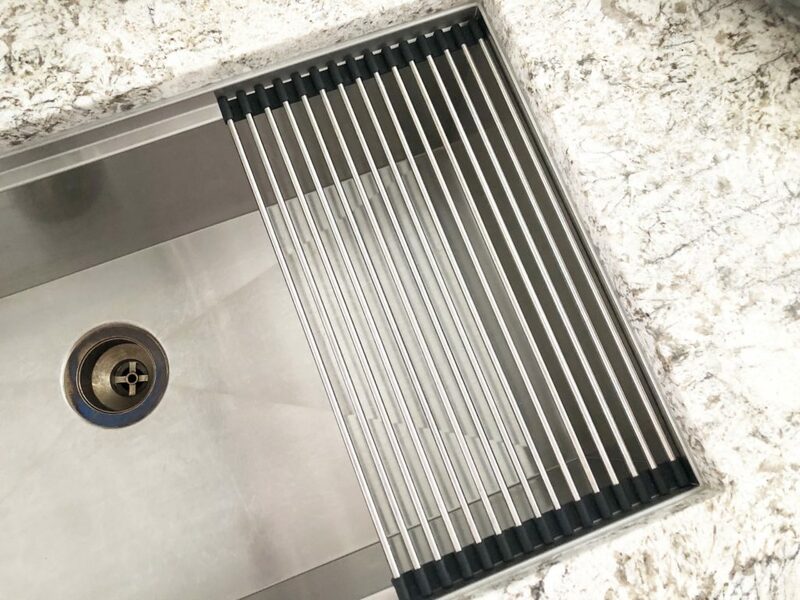 Your sink is the second dirtiest spot in your kitchen (with the sponge being the dirtiest). 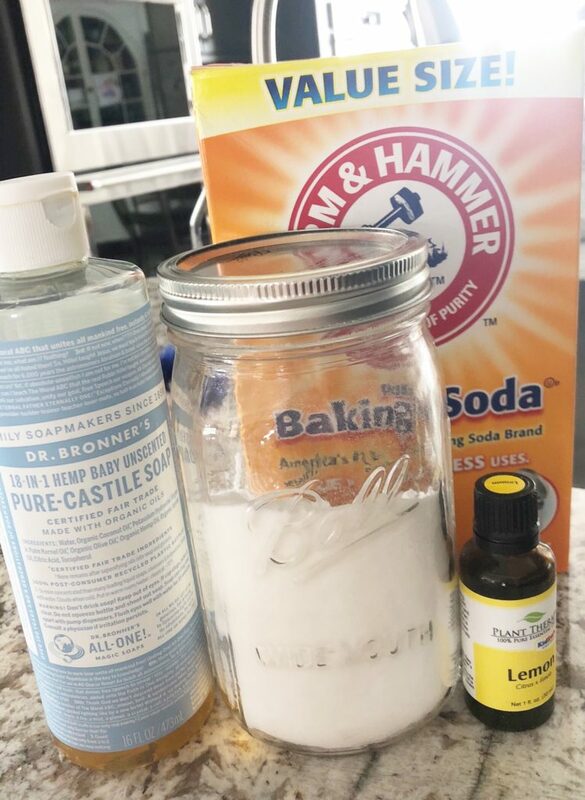 Keep reading to find out a safe and easy 3-ingredient sink cleaner that will help clean and deodorize your sink! Think about everything you put in your sink in a day. Curdled milk from that missing sippy cup you finally found that was hiding under the couch. The very last few sips of your chai tea latte (unless you are like me and almost lick the cup clean ?). Chicken juices from your favorite culinary masterpiece. Mud off the little ones’ shoes. You get it, there are lots of germs that go into your sink in a day. You spray some water to rinse the sink, and off you go without another thought. Well, think about all those germs! 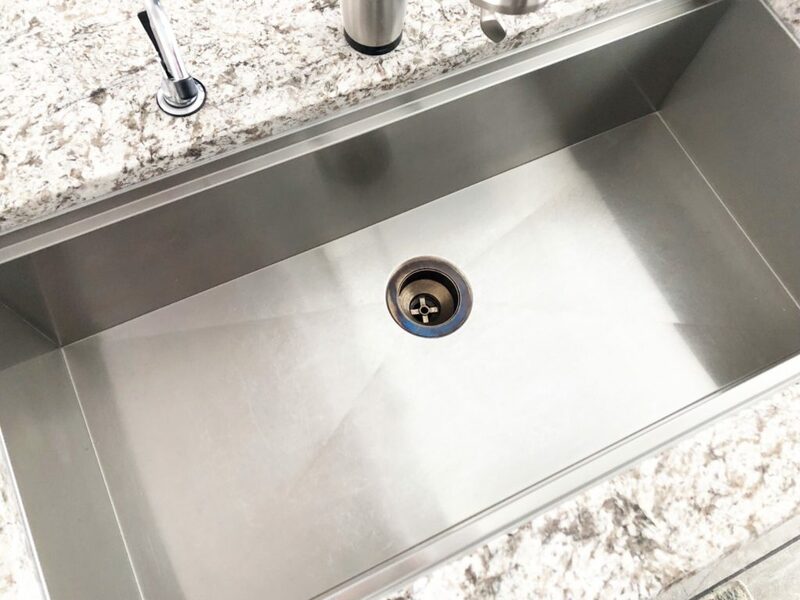 If you don’t do a kitchen scrub weekly, a plaque-like film from raw meat and everything else that goes into your sink will form, and can contaminate anything that touches it. Have I gotten your attention yet?!? 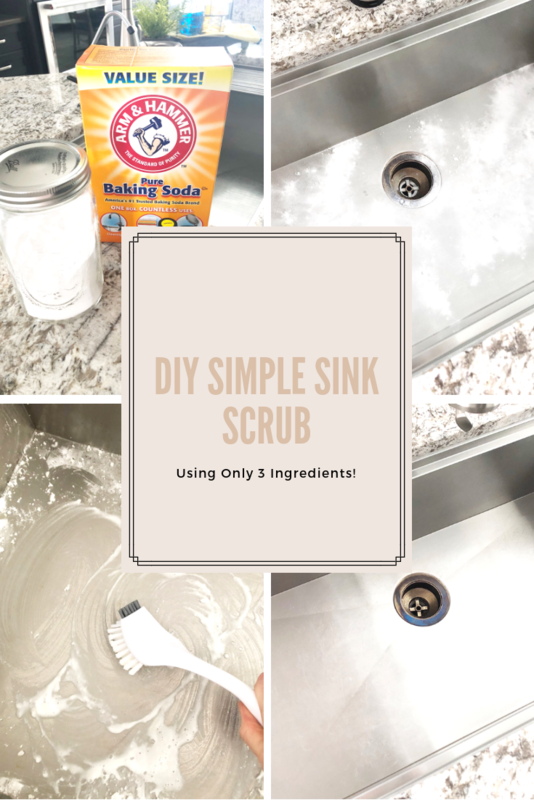 I have a simple 3-ingredient scrub to help decontaminate and clean your sink, and will help ease your mind. 1. Grab any lidded jar. I just use a Ball canning jar, but any jar with a lid will work. 2. Add approximately 2 cups of baking soda to the jar. Baking sodais a gentle abrasive that has deodorizing capabilities. 3. 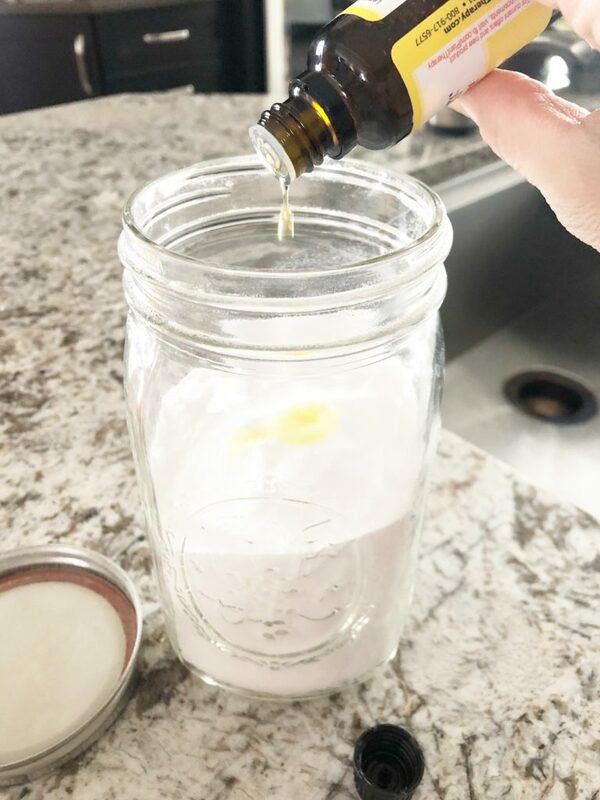 Drop 10 drops of lemon essential oils to the baking soda. Take a knife and cut through the baking soda to mix. 4. Put the lid on the jar and give it another good shake to mix up even better. 5. 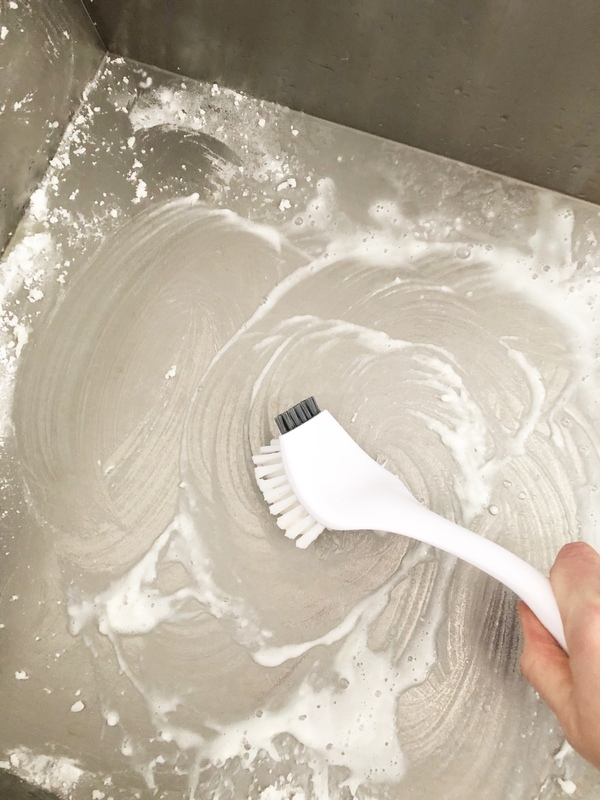 Quickly wipe down your sink with a brush to get all the dirt and grime off. 6. Liberally sprinkle the baking soda mixture over your sink. 7. Squirt Castille soap all over the sink. If you do not have Castile soap, you can use Dawn dish soap. Castile soap is free of synthetic detergents that can cause harm, but instead made of vegetable and hemp oils that gently remove dirt and residue. 8. 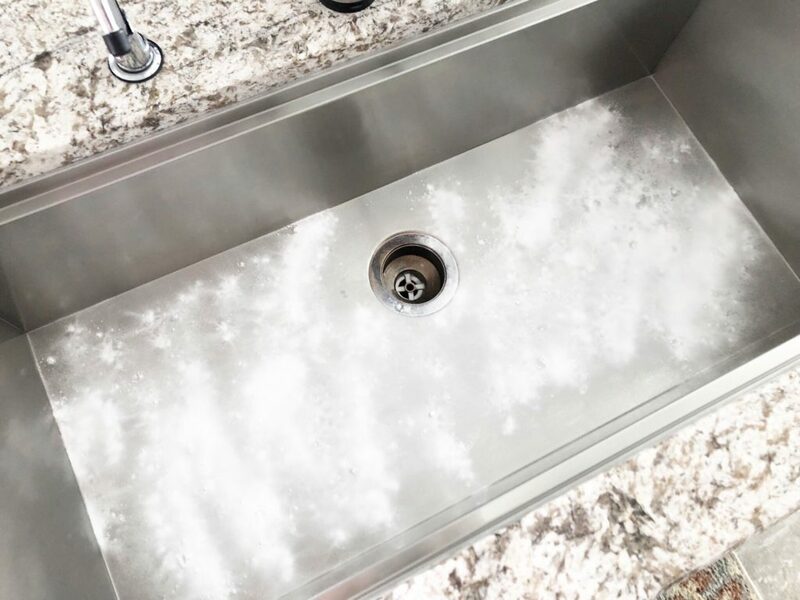 Using a brush, in a circular fashion mix the baking soda mix and Castille soap to clean the entire sink. Make sure you get in the edges really good. You can use an old toothbrush to get in the smaller spots, like where the edges all meet. 9. Let sit for a few minutes. Then rinse thoroughly with water. It is important to rinse thoroughly, otherwise a film can be left on the sink, making it hazy. 10. Using a dry kitchen towel, do a quick dry of the sink. Easy peasy! And you can feel better knowing that your sink doesn’t have a build-up of raw meat juices and other yuck that has been in your sink!! Don’t forget to clean any dish drying racks that you have! Another tip that I do. If you want your sink to shine, add some olive oil to a clean dish cloth and rub in a circular motion. It will leave your stainless steel sink nice and shiny!